The term kernicterus literally means "yellow kern," with kern indicating the most commonly afflicted region of the brain (ie, the nuclear region). Historically, the term refers to an anatomic diagnosis made at autopsy based on a characteristic pattern of staining found in babies who had marked hyperbilirubinemia before they died. Hervieux first described the condition in 1847, and Schmorl first used the term kernicterus as early as 1903. Regions most commonly affected include the basal ganglia; hippocampus; geniculate bodies; and cranial nerve nuclei, such as the oculomotor, vestibular, and cochlear. The cerebellum can also be affected. Bilirubin-induced neurologic dysfunction (BIND) refers to the clinical signs associated with bilirubin toxicity (ie, hypotonia followed by hypertonia and/or opisthotonus or retrocollis) and is typically divided into acute and chronic phases. The 2 terms are commonly used interchangeably, but this use is not technically accurate because one refers to clinical manifestations and the other to an anatomic diagnosis. Much of the traditional teaching regarding hyperbilirubinemia is now being questioned as more is learned about bilirubin metabolism and neurologic injury. Kernicterus is now recognized in the premature infant and, very rarely, in the term infant in the absence of profound hyperbilirubinemia  ; however, other problems (eg, acidosis or infection) are present in term infants without profound hyperbilirubinemia. Conversely, physiologic jaundice (sometimes to levels previously thought to be universally dangerous) has been recognized to be within the reference range in the first week of life in healthy term babies, particularly those who are breastfed. Jaundice of this type usually spontaneously resolves without sequelae. Despite the lack of a clear-cut cause-and-effect relationship between kernicterus and the degree of hyperbilirubinemia, laboratory investigations have demonstrated that bilirubin is neurotoxic at a cellular level. Other in vitro studies have shown bilirubin to have more antioxidant capability than vitamin E, which is commonly assumed to be the most potent antioxidant in the human system. This possible role of bilirubin in early protection against oxidative injury, coupled with identification of multiple neonatal mechanisms to preserve and potentiate bilirubin production, has led to speculation about an as-yet-unrecognized beneficial role for bilirubin in the human neonate. Bilirubin staining can be noted on autopsy of fresh specimens in the regions of the basal ganglia, hippocampus, substantia nigra, and brainstem nuclei. Such staining can occur in the absence of severe hyperbilirubinemia; in this situation, factors influencing permeability of the blood-brain barrier (eg, acidosis, infection) and the amount of unbound (versus albumin-bound) bilirubin may play a role. Characteristic patterns of neuronal necrosis leading to the clinical findings consistent with chronic bilirubin encephalopathy are also essential in the pathophysiology of this entity. Bilirubin staining of the brain without accompanying neuronal necrosis can be observed in babies who did not demonstrate clinical signs of bilirubin encephalopathy but who succumbed from other causes. This staining is thought to be a secondary phenomenon, dissimilar from the staining associated with kernicterus. The exact incidence of kernicterus is unknown. A pilot kernicterus registry monitoring the cases of babies with kernicterus in the United States who have been voluntarily reported shows 125 babies with chronic kernicterus enrolled in the registry from 1984-2002. [5, 6] All but 4 babies reported in the registry had been discharged from the hospital fewer than 72 hours after birth (97%). Five babies were born at home (4%). No sequelae were identified in 9 of 115 infants, and 1 was lost to follow-up. In Denmark, 8 cases of kernicterus were reported from 1994-2002, whereas no cases had been reported for the preceding 20 years. Following this report, from 2002-2005, a more vigilant approach was taken to the management of newborn jaundice, and no more cases have been reported in Denmark. These combined data result in an overall incidence of kernicterus in Denmark of 1.1 in 100,000 live births from 1994-2005. In June 2003, The Quarterly Bulletin of the Royal College of Paediatrics and Child Health announced the commencement of a surveillance program of cases of severe neonatal hyperbilirubinemia following anecdotal reports throughout Britain and Ireland of increasing observation of kernicterus. A 2004 UK surveillance study has reported kernicterus occurring at a rate of 1 in 100,000 live births. Using these data, the risk of developing kernicterus in infants manifesting extreme hyperbilirubinemia (>25 mg/dL) can be estimated across populations. In Canada, this risk calculates to 1 in 17.6 infants, whereas in Denmark, the population risk is estimated as 1 in 16.2. When the threshold of extreme hyperbilirubinemia is increased to >30 mg/dL (>513 μmol/L), the risk of developing kernicterus increases to 1 in 5.5-7 live births, depending on the reports. It should be noted that kernicterus also occurs in infants in whom bilirubin levels remained < 25 mg/dL, and the population risk of this occurrence remains unknown. Hispanic and Asian populations appear to have a greater propensity to develop hyperbilirubinemia, although the underlying explanation for this observation remains elusive. Genetic variants, such as Gilbert disease or G6PD deficiency that occur in sequestered populations, result in geographic and/or ethnic differences in the risk and frequency of kernicterus. Among infants reported in the US kernicterus registry, 58% were white. Asian and Hispanic babies born either in their native countries or in the United States and Native American and Eskimo infants have higher production levels of bilirubin than white infants. Black infants have lower production levels (see image below). The reasons for these racial differences have not been fully elucidated. 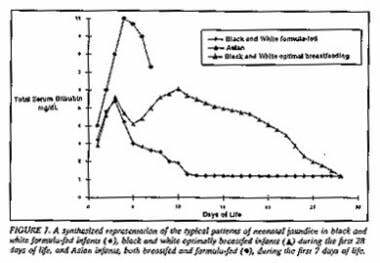 Typical patterns of total serum bilirubin levels in neonates of different racial origins. Used with the permission of the Academy of Pediatrics. Acute bilirubin toxicity appears to occur in the first few days of life of the term infant. Preterm infants may be at risk of toxicity for slightly longer than a few days. If injury has occurred, the first phase of acute bilirubin encephalopathy appears within the first week of life. Brooks JC, Fisher-Owens SA, Wu YW, Strauss DJ, Newman TB. Evidence suggests there was not a "resurgence" of kernicterus in the 1990s. Pediatrics. 2011 Apr. 127(4):672-9. [Medline]. Moll M, Goelz R, Naegele T, Wilke M, Poets CF. Are recommended phototherapy thresholds safe enough for extremely low birth weight (ELBW) infants? A report on 2 ELBW infants with kernicterus despite only moderate hyperbilirubinemia. Neonatology. 2011. 99(2):90-4. [Medline]. Dogan M, Peker E, Kirimi E, Sal E, Akbayram S, Erel O, et al. Evaluation of oxidant and antioxidant status in infants with hyperbilirubinemia and kernicterus. Hum Exp Toxicol. 2011 Nov. 30(11):1751-60. [Medline]. Gkoltsiou K, Tzoufi M, Counsell S, Rutherford M, Cowan F. Serial brain MRI and ultrasound findings: relation to gestational age, bilirubin level, neonatal neurologic status and neurodevelopmental outcome in infants at risk of kernicterus. Early Hum Dev. 2008 Dec. 84(12):829-38. [Medline]. Johnson L, Brown AK. A pilot registry for acute and chronic kernicterus in term and near-term infants. Pediatrics. 1999 Sept. 104:(3):736. Johnson LH, Bhutani VK, Brown AK. System-based approach to management of neonatal jaundice and prevention of kernicterus. J Pediatr. 2002 Apr. 140(4):396-403. [Medline]. Ebbesen F. Recurrence of kernicterus in term and near-term infants in Denmark. Acta Paediatr. 2000 Oct. 89(10):1213-7. [Medline]. Ebbesen F, Andersson C, Verder H, Grytter C, Pedersen-Bjergaard L, Petersen JR, et al. Extreme hyperbilirubinaemia in term and near-term infants in Denmark. Acta Paediatr. 2005 Jan. 94(1):59-64. [Medline]. British Paediatric Surveillance Unit. Surveillance of severe hyperbilirubinaemia in the newborn commenced the May. BPSU Quarterly Bulletin. 2003. 11(2):2. Sgro M, Campbell D, Shah V. Incidence and causes of severe neonatal hyperbilirubinemia in Canada. CMAJ. 2006 Sep 12. 175(6):587-90. [Medline]. Bhutani VK, Johnson L. Kernicterus in the 21st century: frequently asked questions. J Perinatol. 2009 Feb. 29 Suppl 1:S20-4. [Medline]. Johnson L, Bhutani VK, Karp K, Sivieri EM, Shapiro SM. Clinical report from the pilot USA Kernicterus Registry (1992 to 2004). J Perinatol. 2009 Feb. 29 Suppl 1:S25-45. [Medline]. Gamaleldin R, Iskander I, Seoud I, Aboraya H, Aravkin A, Sampson PD. Risk factors for neurotoxicity in newborns with severe neonatal hyperbilirubinemia. Pediatrics. 2011 Oct. 128(4):e925-31. [Medline]. Abu-Osba YK, Jarad RA, Zainedeen KH, Khmour AY. Salting Newborns: Pickling Them or Killing Them? A practice that should be stopped. powerpoint file. Available at http://medical.abu-osba.com/PublishedPapers/20091514331.ppt. Accessed: March 31, 2012. Ahlfors CE. Predicting bilirubin neurotoxicity in jaundiced newborns. Curr Opin Pediatr. 4/2010. 22(2):129-33. [Medline]. Watchko JF, Jeffrey Maisels M. Enduring controversies in the management of hyperbilirubinemia in preterm neonates. Semin Fetal Neonatal Med. 2010 Jun. 15(3):136-40. [Medline]. Rennie JM, Sehgal A, De A, Kendall GS, Cole TJ. Range of UK practice regarding thresholds for phototherapy and exchange transfusion in neonatal hyperbilirubinaemia. Arch Dis Child Fetal Neonatal Ed. 2009 Sep. 94(5):F323-7. [Medline]. McDonagh AF. Ex uno plures: the concealed complexity of bilirubin species in neonatal blood samples. Pediatrics. 2006 Sep. 118(3):1185-7. [Medline]. Ahlfors CE. Predicting bilirubin neurotoxicity in jaundiced newborns. Curr Opin Pediatr. 2010 Apr. 22(2):129-33. [Medline]. Daood MJ, McDonagh AF, Watchko JF. Calculated free bilirubin levels and neurotoxicity. J Perinatol. 2009 Feb. 29 Suppl 1:S14-9. [Medline]. AAP. Management of hyperbilirubinemia in the newborn infant 35 or more weeks of gestation. Pediatrics. 2004 Jul. 114(1):297-316. [Medline]. Yu ZB, Dong XY, Han SP, Chen YL, Quiu YF, Sha L, et al. Transcutaneous bilirubine nomogram for predicting neonatal hyperbilirubinemia in healthy term and late-preterm Chinese infants. Eur J Pediatr. 2/2011. 170(2):185-91. [Medline]. Screening of infants for hyperbilirubinemia to prevent chronic bilirubin encephalopathy: US Preventive Services Task Force recommendation statement. Pediatrics. 2009 Oct. 124(4):1172-7. [Medline]. Bental YA, Shiff Y, Dorsht N, Litig E, Tuval L, Mimouni FB. Bhutani-based nomograms for the prediction of significant hyperbilirubinaemia using transcutaneous measurements of bilirubin. Acta Paediatr. 2009 Dec. 98(12):1902-8. [Medline]. Mehta S, Kumar P, Narang A. A randomized controlled trial of fluid supplementation in term neonates with severe hyperbilirubinemia. J Pediatr. 2005. 147 (6):781 - 5. [Medline]. Sanpavat S. Exchange transfusion and its morbidity in ten-year period at King Chulalongkorn Hospital. J Med Assoc Thai. 2005 May. 88(5):588-92. [Medline]. Badiee Z. Exchange transfusion in neonatal hyperbilirubinaemia: experience in Isfahan, Iran. Singapore Med J. 2007 May. 48(5):421-3. [Medline]. Bisceglia M, Indrio F, Riezzo G, Poerio V, Corapi U, Raimondi F. The effect of prebiotics in the management of neonatal hyperbilirubinaemia. Acta Paediatr. 2009 Oct. 98(10):1579-81. [Medline]. Gourley GR, Li Z, Kreamer BL, Kosorok MR. A controlled, randomized, double-blind trial of prophylaxis against jaundice among breastfed newborns. Pediatrics. 2005 Aug. 116(2):385-91. [Medline]. Dennery PA. Metalloporphyrins for the treatment of neonatal jaundice. Curr Opin Pediatr. 2005 Apr. 17(2):167-9. [Medline]. Kaplan M, Kaplan E, Hammerman C, et al. Post-phototherapy neonatal bilirubin rebound: a potential cause of significant hyperbilirubinaemia. Arch Dis Child. 2006 Jan. 91(1):31-4. [Medline]. Newman TB, Kuzniewicz MW, Liljestrand P, Wi S, McCulloch C, Escobar GJ. Numbers needed to treat with phototherapy according to American Academy of Pediatrics guidelines. Pediatrics. 2009 May. 123(5):1352-9. [Medline]. [Full Text]. Martins BM, de Carvalho M, Moreira ME, Lopes JM. Efficacy of new microprocessed phototherapy system with five high intensity light emitting diodes (Super LED). J Pediatr (Rio J). 2007 May-Jun. 83(3):253-8. [Medline]. Romagnoli C, Zecca E, Papacci P, Vento G, Girlando P, Latella C. Which phototherapy system is most effective in lowering serum bilirubin in very preterm infants?. Fetal Diagn Ther. 2006. 21(2):204-9. [Medline]. van Kaam AH, van Beek RH, Vergunst-van Keulen JG, et al. Fibre optic versus conventional phototherapy for hyperbilirubinaemia in preterm infants. Eur J Pediatr. 1998 Feb. 157(2):132-7. [Medline]. Keren R, Bhutani VK, Luan X, Nihtianova S, Cnaan A, Schwartz JS. Identifying newborns at risk of significant hyperbilirubinaemia: a comparison of two recommended approaches. Arch Dis Child. 2005 Apr. 90(4):415-21. [Medline]. Keren R, Luan X, Friedman S, Saddlemire S, Cnaan A, Bhutani VK. A comparison of alternative risk-assessment strategies for predicting significant neonatal hyperbilirubinemia in term and near-term infants. Pediatrics. 2008 Jan. 121(1):e170-9. [Medline]. Csoma Z, Toth-Molnar E, Balogh K, et al. Neonatal blue light phototherapy and melanocytic nevi: a twin study. Pediatrics. 2011 Oct. 128(4):e856-64. [Medline]. Raghavan K, Thomas E, Patole S, Muller R. Is phototherapy a risk factor for ileus in high-risk neonates?. J Matern Fetal Neonatal Med. 2005 Aug. 18(2):129-31. [Medline]. Chen J, Sadakata M, Ishida M, Sekizuka N, Sayama M. Baby massage ameliorates neonatal jaundice in full-term newborn infants. Tohoku J Exp Med. 2011. 223(2):97-102. [Medline]. Lazarus C, Avchen RN. Neonatal hyperbilirubinemia management: a model for change. J Perinatol. 2009 Feb. 29 Suppl 1:S58-60. [Medline]. Bhutani VK, Johnson L. A proposal to prevent severe neonatal hyperbilirubinemia and kernicterus. J Perinatol. 2009 Feb. 29 Suppl 1:S61-7. [Medline]. Ahlfors CE, Wennberg RP. Bilirubin-albumin binding and neonatal jaundice. Semin Perinatol. 2004 Oct. 28(5):334-9. [Medline]. AlOtaibi SF, Blaser S, MacGregor DL. Neurological complications of kernicterus. Can J Neurol Sci. 2005 Aug. 32(3):311-5. [Medline]. Bader D, Yanir Y, Kugelman A, et al. Induction of early meconium evacuation: is it effective in reducing the level of neonatal hyperbilirubinemia?. Am J Perinatol. 2005 Aug. 22(6):329-33. [Medline]. Barefield ES, Dwyer MD, Cassady G. Association of patent ductus arteriosus and phototherapy in infants weighting less than 1000 grams. J Perinatol. 1993 Sep-Oct. 13(5):376-80. [Medline]. Bhutani VK, Donn SM, Johnson LH. Risk management of severe neonatal hyperbilirubinemia to prevent kernicterus. Clin Perinatol. 2005. 32 (1):125 - 39, vii. [Medline]. Bhutani VK, Johnson L, Sivieri EM. Predictive ability of a predischarge hour-specific serum bilirubin for subsequent significant hyperbilirubinemia in healthy term and near-term newborns. Pediatrics. 1999 Jan. 103(1):6-14. [Medline]. [Full Text]. Bhutani VK, Johnson LH, Jeffrey Maisels M, et al. Kernicterus: epidemiological strategies for its prevention through systems-based approaches. J Perinatol. 2004 Oct. 24(10):650-62. [Medline]. Cashore WJ. Bilirubin and jaundice in the micropremie. Clin Perinatol. 2000 Mar. 27(1):171-9, vii. [Medline]. Drummond GS, Kappas A. Chemoprevention of severe neonatal hyperbilirubinemia. Semin Perinatol. 2004 Oct. 28(5):365-8. [Medline]. Gartner LM. Neonatal jaundice. Pediatr Rev. 1994 Nov. 15(11):422-32. [Medline]. Juretschke LJ. Kernicterus: still a concern. Neonatal Netw. 2005 Mar-Apr. 24(2):7-19. [Medline]. Kaplan M, Hammerman C. Understanding severe hyperbilirubinemia and preventing kernicterus: adjuncts in the interpretation of neonatal serum bilirubin. Clin Chim Acta. 2005 Jun. 356(1-2):9-21. [Medline]. Kumral A, Genc S, Genc K, et al. Hyperbilirubinemic serum is cytotoxic and induces apoptosis in murine astrocytes. Biol Neonate. 2005. 87(2):99-104. [Medline]. MacMahon JR, Stevenson DK, Oski FA. Physiologic jaundice. Taeusch, Ballards, eds. Avery's Disease of the Newborn. 7th ed. Philadelphia, PA: Saunders; 1998. 1003-7. Maisels MJ. Jaundice. Avery, Fletcher, eds. Neonatology, Pathophysiology and Management of the Newborn. 5th ed. Philadelphia, PA: Lippincott; 1999. 765-819. Petersen JR, Okorodudu AO, Mohammad AA, et al. Association of transcutaneous bilirubin testing in hospital with decreased readmission rate for hyperbilirubinemia. Clin Chem. 2005. 51 (3):481 - 2. [Medline]. [Full Text]. Pezzati M, Biagiotti R, Vangi V, et al. Changes in mesenteric blood flow response to feeding: conventional versus fiber-optic phototherapy. Pediatrics. 2000 Feb. 105(2):350-3. [Medline]. [Full Text]. Rubegni P, Cevenini G, Sbano P, et al. Cutaneous colorimetric evaluation of serum concentrations of bilirubin in healthy term neonates: a new methodological approach. Skin Res Technol. 2005 Feb. 11(1):70-5. [Medline]. Sanpavat S, Nuchprayoon I. Noninvasive transcutaneous bilirubin as a screening test to identify the need for serum bilirubin assessment. J Med Assoc Thai. 2004 Oct. 87(10):1193-8. [Medline]. Shapiro SM. Definition of the clinical spectrum of kernicterus and bilirubin-induced neurologic dysfunction (BIND). J Perinatol. 2005 Jan. 25(1):54-9. [Medline]. Taketomo CK, Hodding JH, Draus DM. Pediatric Dosage Handbook. 10th ed. Cleveland, OH: Lexi-Comp, Inc; 2003. Volpe JJ. Bilirubin and Brain Injury: Neurology of the Newborn. 3rd ed. Philadelphia, PA: WB Saunders; 1995. 490-514. Watchko JF. Vigintiphobia revisited. Pediatrics. 2005 Jun. 115(6):1747-53. [Medline]. Willems WA, van den Berg LM, de Wit H, Molendijk A. Transcutaneous bilirubinometry with the Bilicheck in very premature newborns. J Matern Fetal Neonatal Med. 2004 Oct. 16(4):209-14. [Medline]. Hour-specific nomogram for total serum bilirubin and attendant risk of subsequent severe disease in term and preterm infants. Used with the permission of the Academy of Pediatrics. Magnetic resonance image of 21-month-old with kernicterus. Area of abnormality is the symmetric high-intensity signal in the area of the globus pallidus (arrows). Courtesy of M.J. Maisels. Neuronal changes observed in kernicterus. Courtesy of J.J. Volpe. Does Light Therapy Increase the Risk for Cancer in Kids?